If you could have a chat with any famous person (past or present) who would you want to meet and why? Having thought about it a little more, and considered and rejected various occupations such as prominent authors, leaders, royalty, sportspeople, musicians, gardeners, chefs, entrepreneurs well I'm still struggling. Monty Don would have been a contender and we heard him speak recently which I enjoyed. However I took from that, that he's quite a private person and so I probably wouldn't learn too much more and even though he said his motto in life is to say yes, in this case I'm not sure he would! I think it's safe to say there's no one famous I'm especially keen to meet. In fact I could probably talk to someone famous without knowing they were famous, who they were, or why they were famous... Sad but true. That'll have to be Jack Johnson's In Between Dreams as it's the one with "Better Together" on which played as we signed the register at our wedding. It's an album that always brings a smile to my face. 3. Mascara - waterproof of course! If Hollywood made a film of your life, who would you cast to play you? Well, funny you ask - I have no idea - but it was discussed once, like you do after a few glasses of red. And it was decided by my then work colleagues that Jodie Foster would be perfect. So Jodie Foster please. Phew, another relatively easy question. I have now finished the latest Bridget Jones book and it was good to catch up with how life's treated her. As you can imagine it hasn't all been plain sailing, as that would make for a very dull read. What would be your biggest tip to share with a newbie blogger? Proof read your posts before you publish them and then once again as soon as you've hit publish. It's amazing how many times you only spot an error - typo, missing word or whatever - immediately after publishing, I don't think it's just me. Lots of simple errors are the biggest turnoff for me when I discover new blogs and I'll quickly move away if there's too many errors in a single post (she says hastily re-reading this post). - Mary at Keynko.com were hugely friendly and supportive when I started out in the world of blogging - thank you ladies. Mary has recently posted a Q&A meme response so I'm sharing that here, instead of landing another load of questions on her, unless of course she wants to participate. 1. What's your greatest achievement? 2. What do you know now that you wished you'd known twenty years ago? 3. If you were to take part in a reality TV show, which one would it be, and why? 4. If you were a cake, what would you be? 5. If you could hold back time, at what age would you stick at? 6. What skill have you developed most since starting your blog? 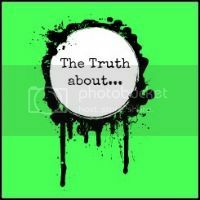 I'm linking this post to Sam's The Truth About Linky, as rather vainly it's the truth about me this week.